Stamp collecting is a very common hobby mainly because you can take it up with ease. You don’t need to spend too much on equipment and you don’t need extensive equipment either. Even if you don’t have the extensive tools, you will just do fine. All you need is some basic equipment such as tweezers. You mostly have them already! There are a few other tools that you may require as a stamp collector to handle your stamps better. No matter what levels of stamp collection you may be at, these tools will come useful. Don’t worry because all these tools are affordable and won’t hurt your pocket much. Another good thing is that most of these tools have a long lifespan. Thus, you only have to buy them once and forget about any investment for a few fears. Some tools are important for handling your stamps carefully and some others are useful for proper examination of your stamps. They will help you understand your collection better and ease your organization. You will need a magnifying glass to examine your stamps carefully. Even a small magnifying glass is extremely useful and powerful. You just need some patience and practice, and soon you will be able to make out even small mistakes and flaws in your stamps easily. One can define perforations as "the series of holes between rows of postage stamps in a sheet that serve as an aid in separation." Thus, a perforation gauge will help you read how many roulettes or holes are present in the stamps. At one time, 2cm can be measured. You may already know that even similar looking stamps may contain different perforations. Thus, it is important to measure the perforations of each stamp to categorize them. These are simple tools and you need them because you are never supposed to handle your stamps with your fingers. You have different types of tweezers to choose from such as plastic ones and stainless steel ones. Make sure the gripping edges are not very sharp. They should be considerably blunt. If they are sharp, they could damage your stamps. Even the cleanest hands have some muck and some oils that can ruin your stamps. Thus, handling them with tweezers is the safest thing to do. Another advantage of using a pair of tweezers is that you will look like a thorough professional! Stamp hinges are nothing but paper pieces. These have some gum on them. These are used to glue your stamps to the album page. You attach the glued end to the stamp’s backside and then attach it to the album page. If you do this, your stamps will actually get spoilt, especially the mint ones. What should you do then? You should use mounts. These will not cause any damage to your stamps or the gum of the stamps. You can insert your stamp into the mount and then glue the mount onto the page of the album. The front of these mounts is made out of clear plastic so that you can see your stamp. The back may be black or white. Benzine is a watermark detector. However, it is dangerous because it is inflammable. You should drip this colorless liquid onto the back of your stamp to see if there are any faint patterns or watermarks. Be sure to be very careful when using this liquid. Stay away from all kinds of flames – even the faintest ones. This tool is used to detect what type of paper you are holding. It is rod-like and has a silver tip. When you use it on a chalk-surface paper, it will leave a mark. This will help you identify the paper. This tool is more on the sophisticated side. This box consists of a damp pad. 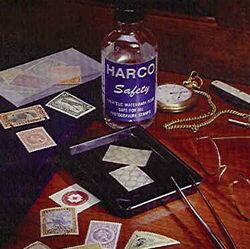 The pad is important to clean out hinges as well as the backs of mint stamps to remove any attached paper. The pad will not disturb the gum. This box ensures very precise and easy cleaning of the stamps and that is actually thanks to the condensation forces enclosed in the box. This apparatus has become very popular today for print detection. You can examine fluorescent and phosphorous marking easily on the stamps through a UV lamp. UV lamps are very common tools for philatelists because the light helps them inspect the stamps and check whether they need any repairing. They can also verify if the stamp is forged.